The York Nostalgia Nationals could have also been called “The Confusion Nationals”, or “The Miscommunication Nationals” or even “The Frustration Nationals”. Of course the rain this past weekend played a major part for all of these alternate names. 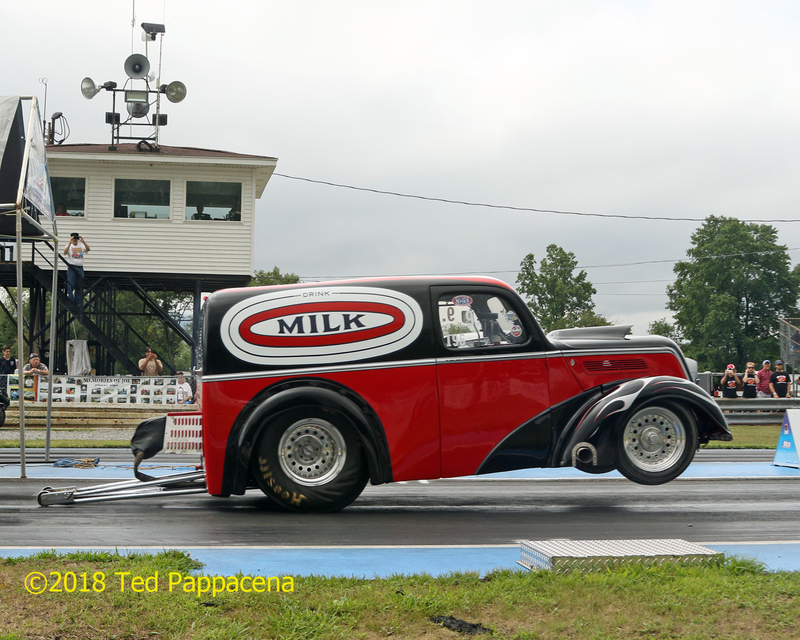 The York Nostalgia Nationals is held the Sunday after the York Reunion 2 day event held (until this year) annually at the EMMR (Eastern Museum of Motorsports Racing). 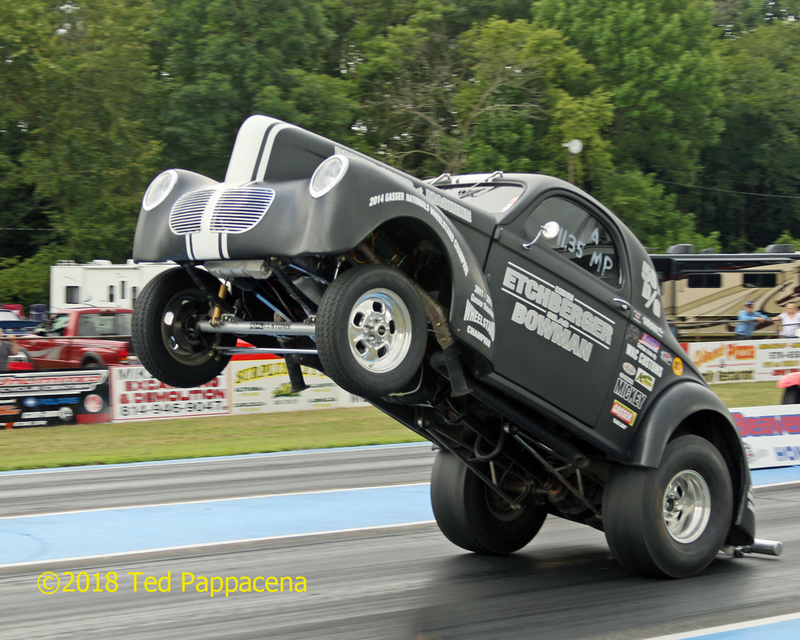 Mike Etchberger puts the “Filthy Forty” tribute Willys into orbit. 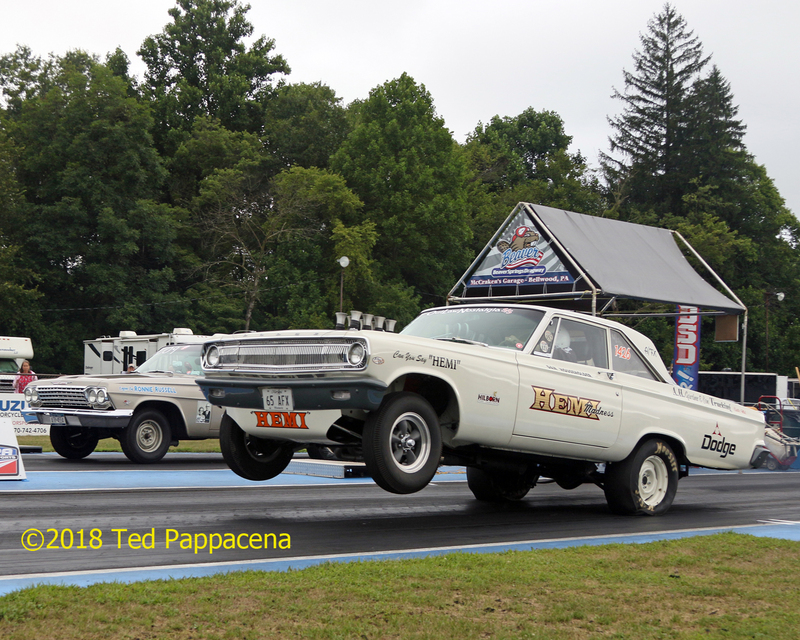 We started our trip to Beaver Springs Dragway early Saturday morning and arrived to threatening skies just before noon. There were a lot of entrants so we (photographer Alan Aug and I) went our separate ways to get pit shots while some time trials were going on. 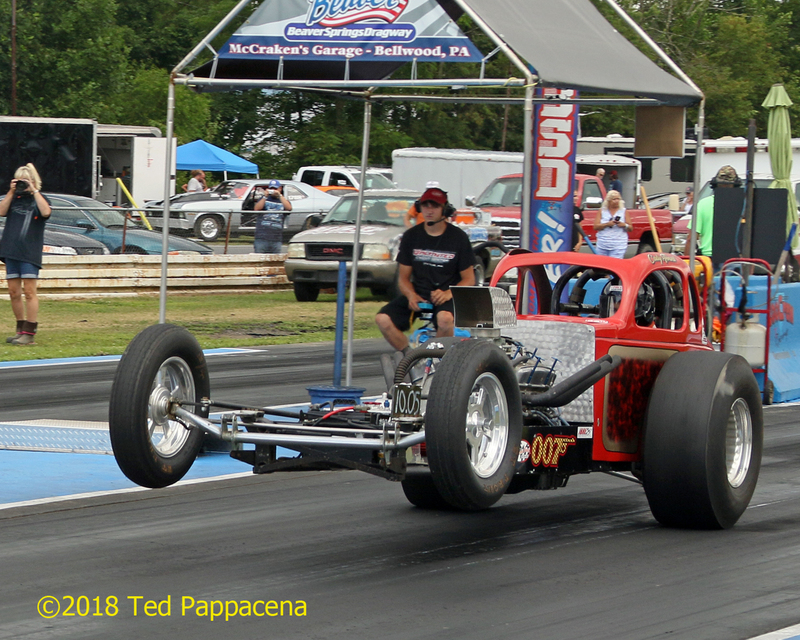 I was pleased to see that 4 supercharged gassers were on hand for runs on both days. After a round of time trials and qualifying, the sky opened up and it poured. 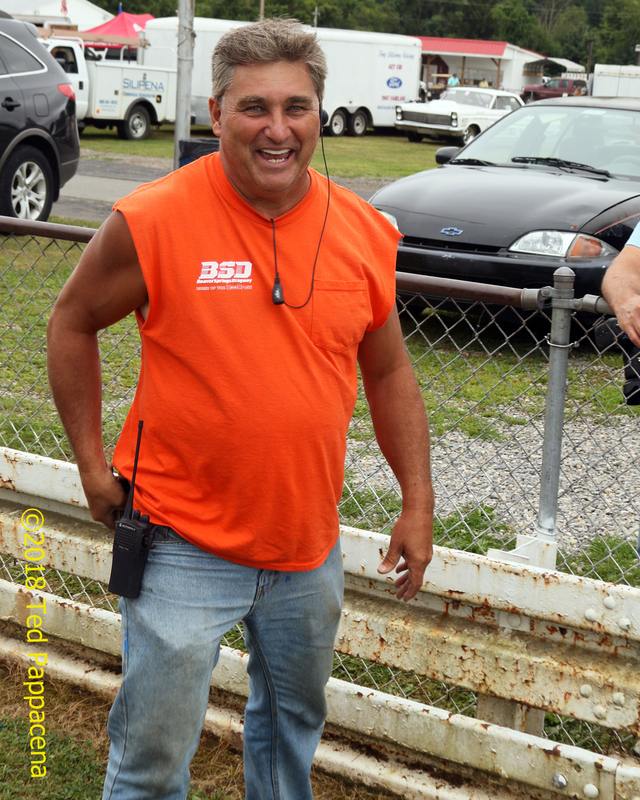 So much so that at 3:30 PM the event was called by track owner and operator Mike Mc Cracken. He did say that although it was over for Saturday, Sunday looked better weather wise and the track would open at 8 AM with qualifying to start promptly at 9. So off to the motel we went. 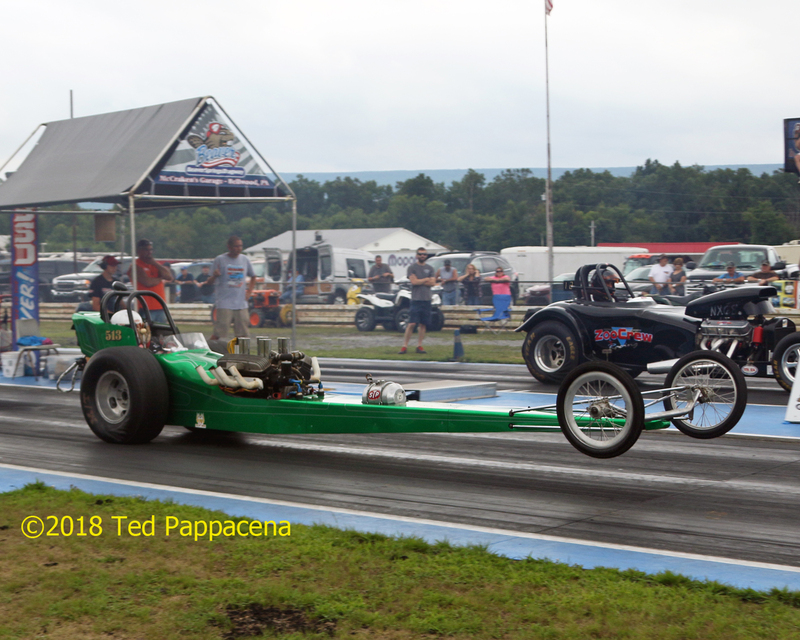 New Beaver Springs Dragway owner/operator Mike Mc Cracken had quite a show despite the rain and drama. AA/GS stalwart “Ohio” George Montgomery was the only Legend on hand to sign autographs. This is where all the confusion started. Once in the room, I checked Facebook only to see that a friend said that the Sunday event was cancelled and he was going home. I responded that wasn’t what we heard being as we just left the track not even a half an hour ago. What transpired since then I asked? Well there was an announcement at the York Reunion show that the event was cancelled. So all of the cars that were on display that usually show up for the Nationals packed up and went home as did the Legion of Heroes and potential spectators. I found out later on that the exhibition cars were cancelled too. By who, I don’t know. Mike emphatically responded on Facebook that the event was not in fact cancelled but it seemed that the damage was done. 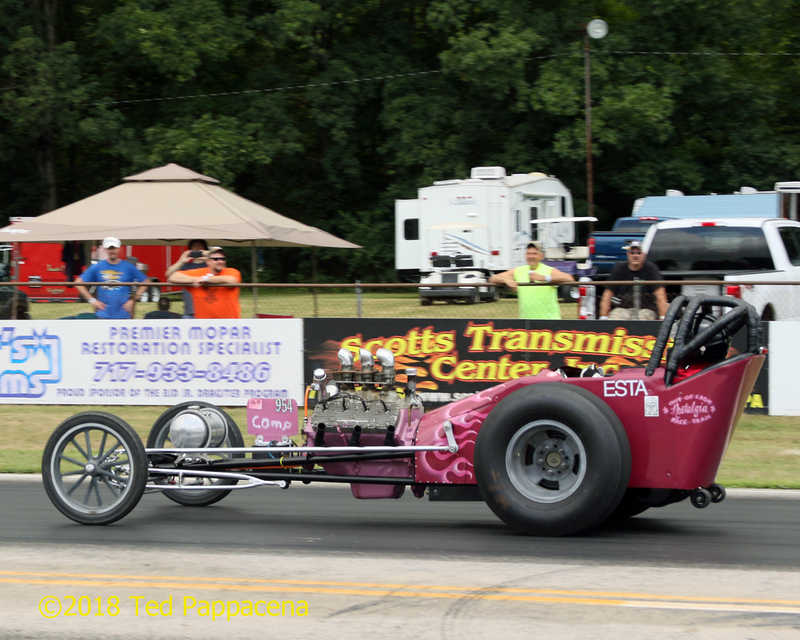 East Coast Gassers featured smokey burnouts and wheels up action. 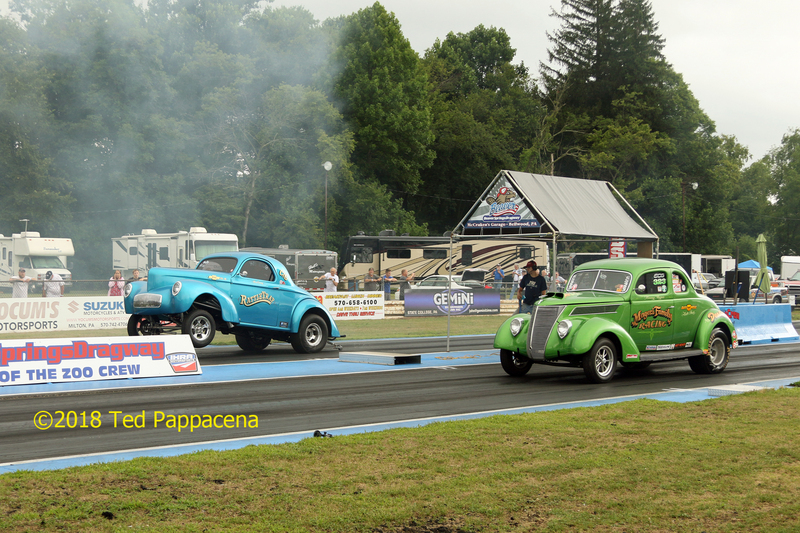 The Magers Family Ford takes on the wheelstanding “Rattletrap” Willys. 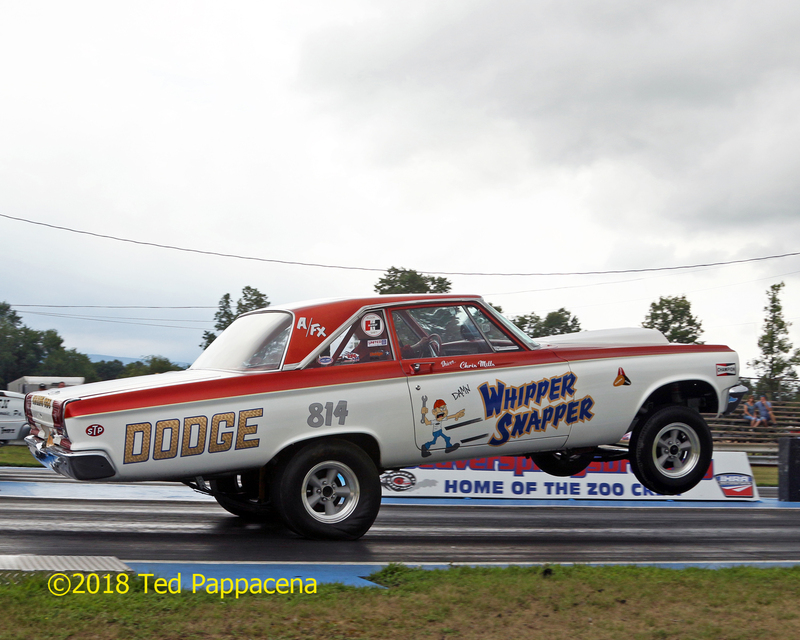 Chris Mills’ “Whipper Snapper” A/FX Coronet got “WOWs” from the crowd with these circa 1965 launches. Ron Wallace’s Frustration II Corvette leaps off the line. We went back to the track early Sunday morning to sunny skies although it did look threatening during some parts of the day. I was disappointed to see that the supercharged gassers had left the track. 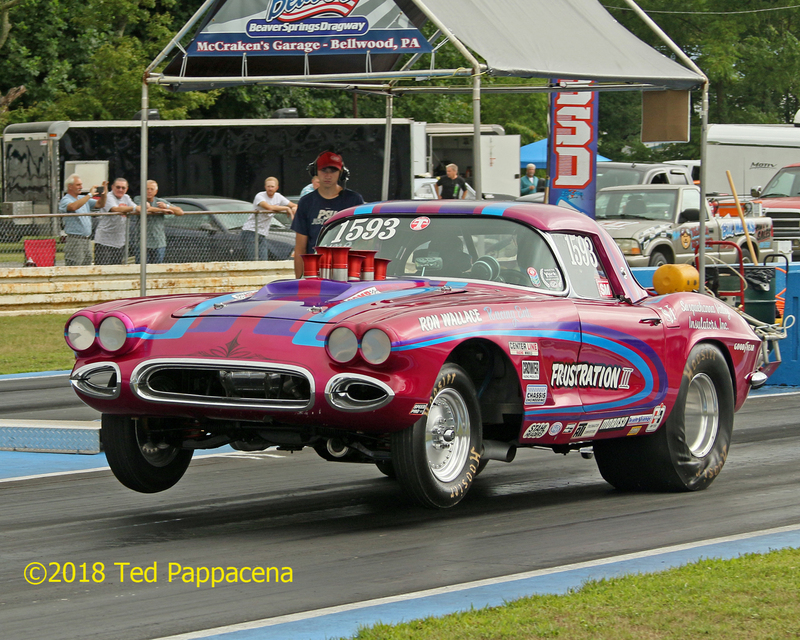 I also heard that the funny cars would not be there either or the fuel altered or any of the other cars I thought would be there. Yet, the pits were fairly full. 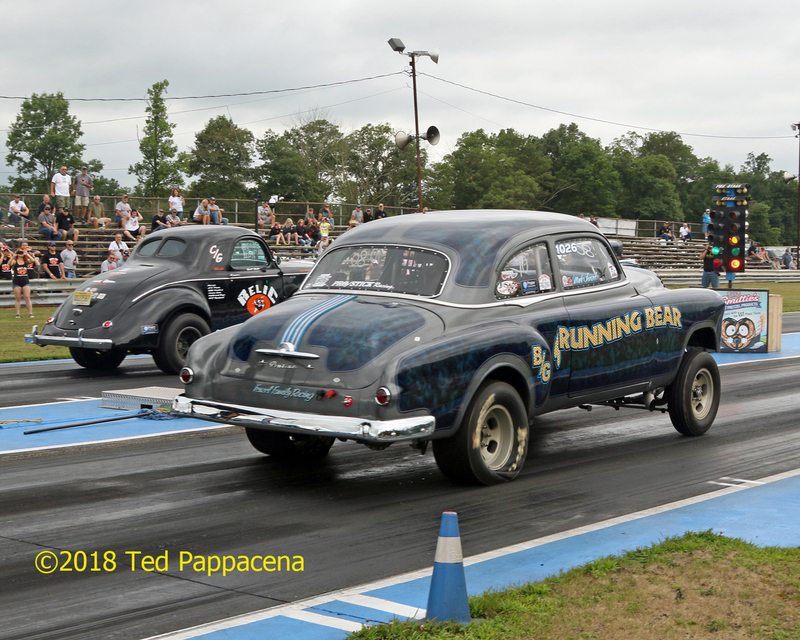 After all the threat of rain and false announcements, we still had Nostalgia Super Stocks (including 2 altered wheelbase A/FX cars), the North East Timing Organization (NETO), and the East Coast Gassers. 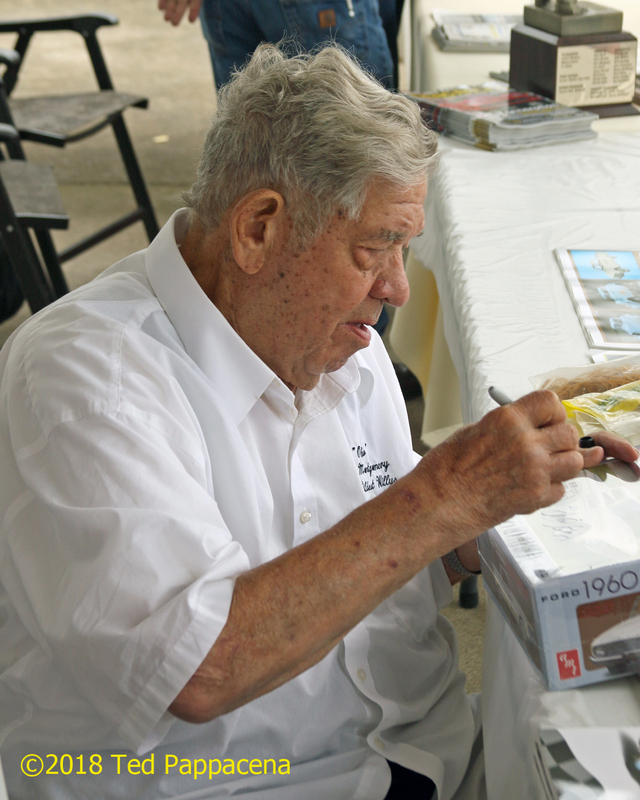 One Legend from the Reunion was on hand to sign autographs; Ohio George Montgomery. Spectator count was a shade over 200 and what they saw did not disappoint. Round after round of intense racing with long smoky burnouts and towering wheelstands was the order of the day. So despite all of the above, there was no rain and a great day was had by all. No major incidents to speak of and Mike had the track running like a Swiss watch. Hopefully next year’s event will have neither the rain nor the drama. 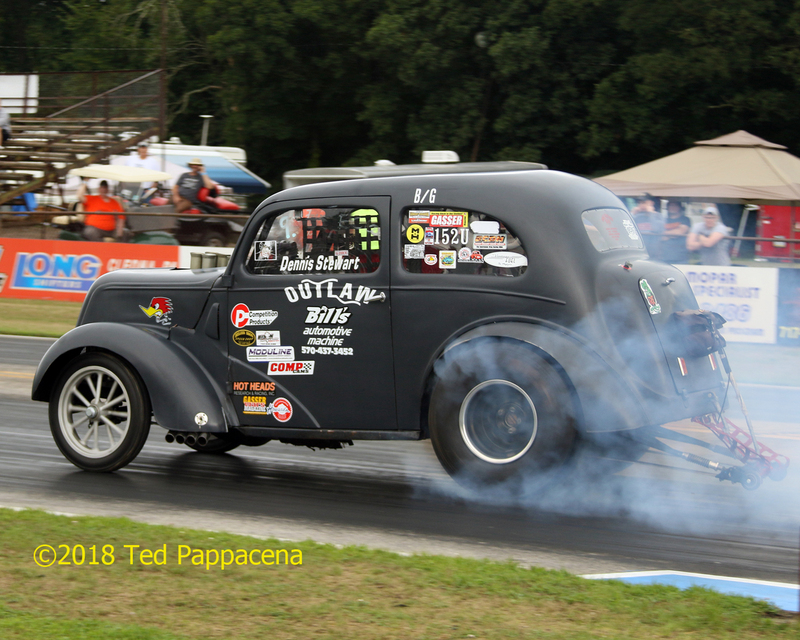 Dennis Stewart’s primer A/G Anglia laid down scorching burnouts on each of his passes. 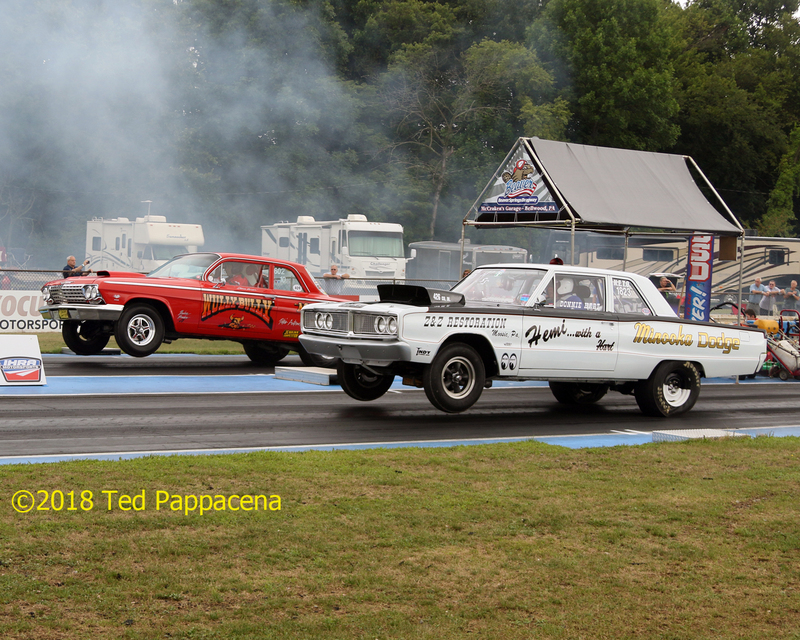 Nostalgia Super Stock wheels up action were the order of the day. Green injected Chevy digger blasts off the line with the front end dangling in the air. Cody Fenzel’s weird looking comp coupe launches hard. Guy Johnson’s Thames ran strong 9s all day. Doesn’t look like the “Running Bear” Pontiac will do any running with that red bulb shining.